Whether it’s the first or fourth, picking your little one's first school can be both exciting and overwhelming. Deep breaths. You got this. 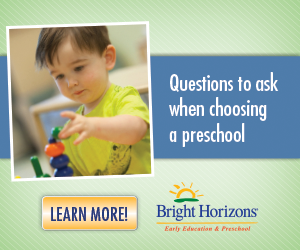 Yes, preschool is the foundation of your child’s education and a very important decision. With a little prep and a list of what to look for, you’ll find a place that’s the perfect fit for you and your family. Here are 7 questions to ask (both yourself and the school) before you make the big decision. 1) What's the daily schedule? Look for a well-rounded day that includes structured activities, free-play, story-time and (our fave) nap time. Note, the length of time spent on activities may change from one day to the next, but it is helpful when the pattern of events is consistent and predictable. Little ones thrive on consistency. 2) Ask about School Readiness. Will the curriculum prepare your kiddo for elementary school? Programs that support social, emotional and intellectual growth help prepare children for their transition into kindergarten and beyond. Take Bright Horizons for example. Their emergent curriculum allows their teachers to plan activities and projects based on the children they work with, taking into account their skills, needs and interests so that they are positioned for success. 3) Ask about staff and teachers’ experience and background. You will want to check and make sure the teachers are certified in both early education and CPR. Also, you really want the teachers and staff to love coming into work each day. Ask the teachers themselves if they enjoy working there. Is the school or center warm and welcoming? Happy teachers make for happy students! 4) Potty training protocol, explained. Some programs require incoming preschoolers to be FULLY potty trained. Can staff and teachers help little ones who are new to the potty, or will you be called in for every accident? Understand the potty expectations and ask yourself, are we there yet? 5) Sick kids: What’s the illness policy? Find out how long kids need to be fever and symptom-free before coming back to school. Pro-tip: Ask if parents are notified when there’s a nasty virus circulating. 6) Does the school extend learning resources beyond the classroom? 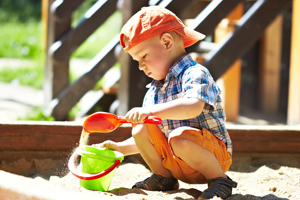 It's a great sign when a program provides optional learning at-home activities for your preschooler. For example, schools may send home fun worksheets, the classroom pet (live or stuffed) to take care of for the weekend. Some invite families to share photos with the teachers of independently planned home activities, heading to the library, playing with puzzles, etc... These show what the children learn at school and it how now it is in return repeated at home. 7) What's included with tuition? 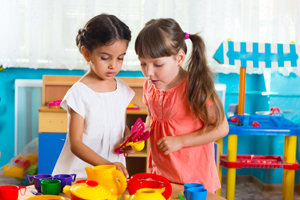 Be sure to confirm what is exactly included with a preschool program and what extra activities might be an additional cost. See? That wasn't too bad. Ok, now get the tissues and the camera ready. 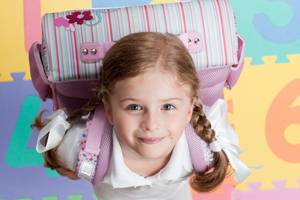 Capture that cuteness as your backpack-clad preschooler gets ready to take on the world! Whether you’re returning to work after having a baby, or trying to improve upon your existing routine, choosing the best early education program for your child can seem overwhelming. Bright Horizons is committed to supporting working parents and helping children thrive. Their centers offer: reliable care that fits your routine, hours that fit your work schedule, locations close to your home or office, outstanding programs that grow along with your child.